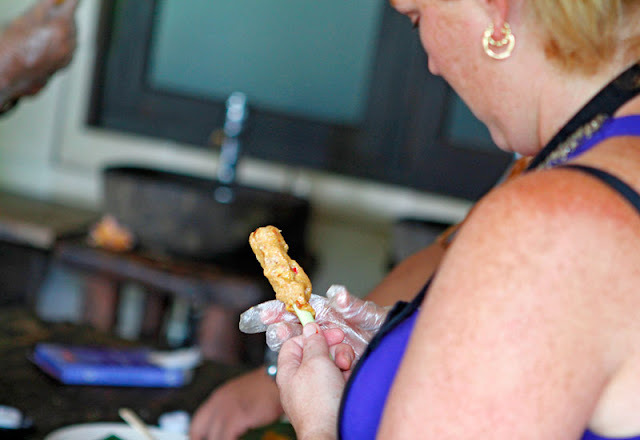 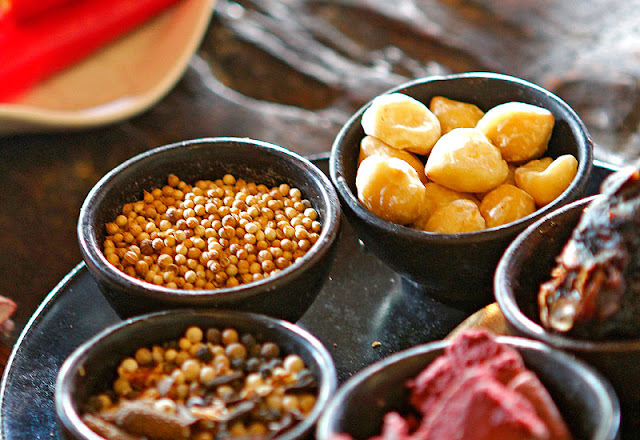 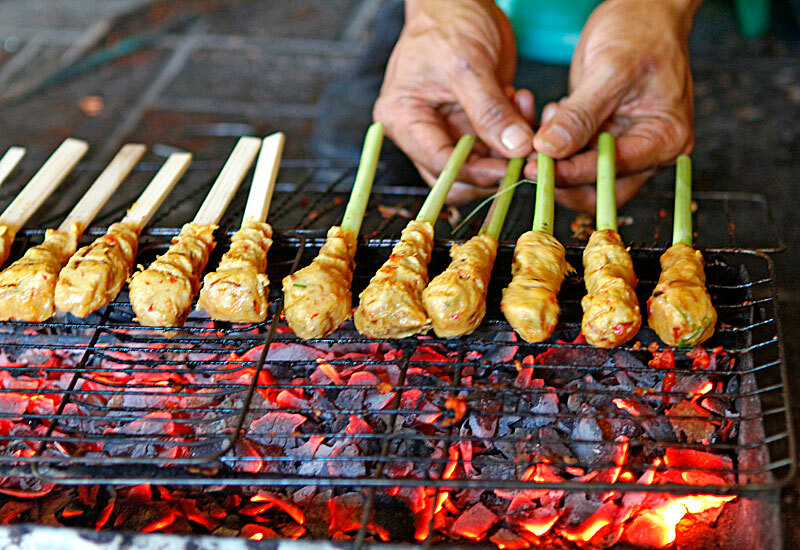 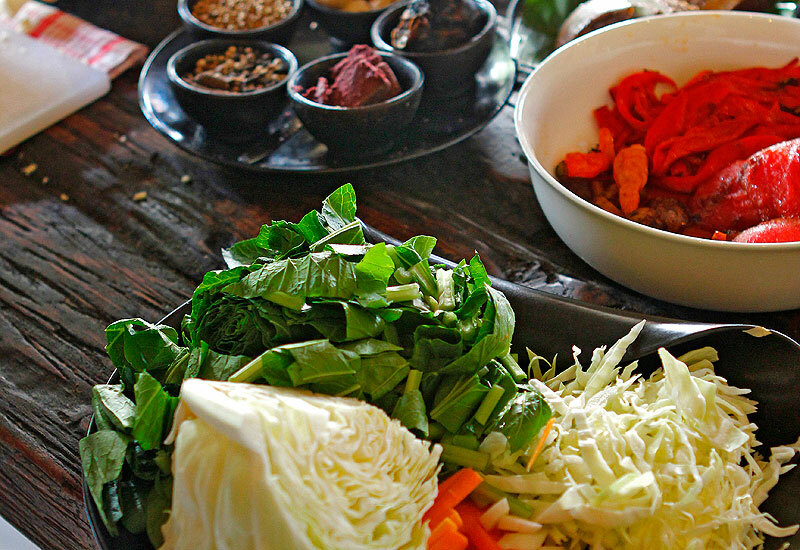 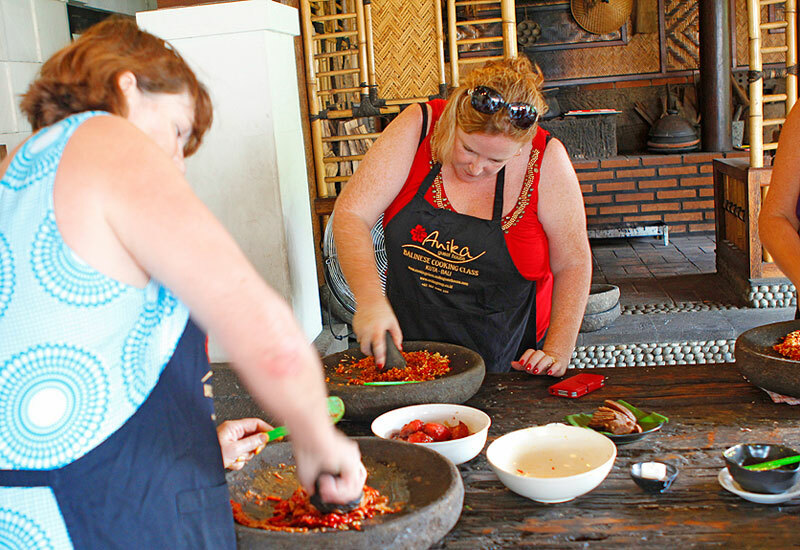 Balinese Cooking is Creative Process That is Simple and a Lot Of Fun … ! You can get Bali cooking lessons in Anika Bali Cooking Class. 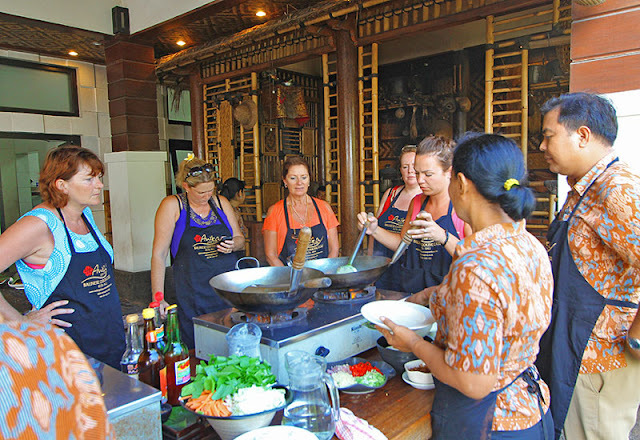 Here, you will learn the techniques and become familiar with the fresh herbs, spices, and other ingredients that make Balinese food delightfully tasty as well as nutritious and cleansing. 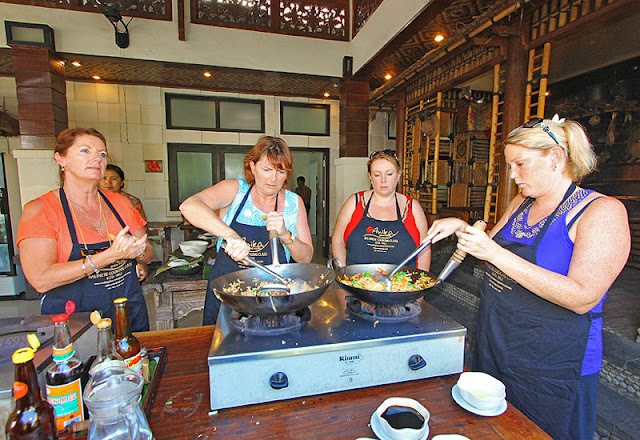 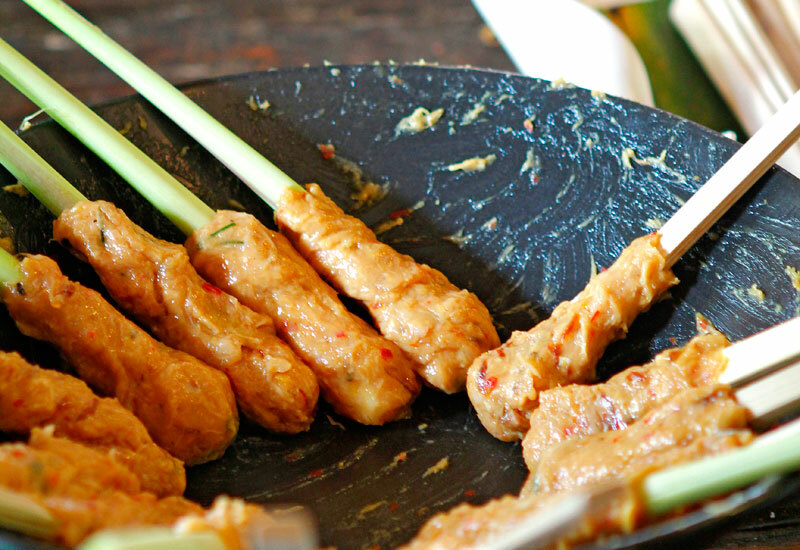 hrough demonstration and hands-on experience, we will prepare and breakfast, lunch, afternoon tea or dine together on an assortment of exquisite dishes, from satay and grilled fish and curries to black rice pudding dessert. If you are interested in learning how to prepare Balinese signature dishes but you do not have too much time to dedicate to it, consider to join our class. 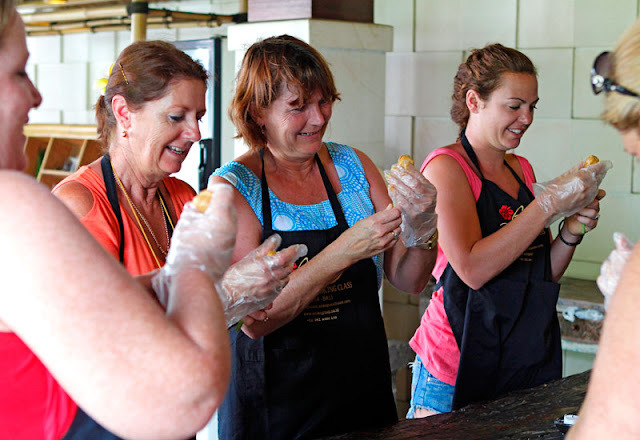 Register now by online form or direct. 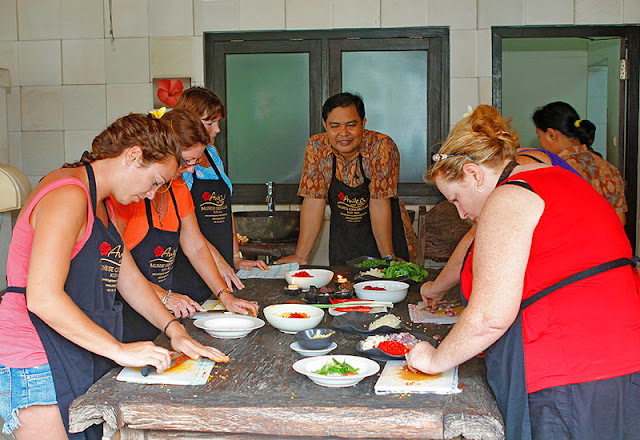 With reasonable fee, 10 subject menus per class, include transfer service (Kuta, Sanur, Nusa Dua, Seminyak, Jimbaran area only), traditional market tour (morning class only), booklet, menu recipes, and certificate. 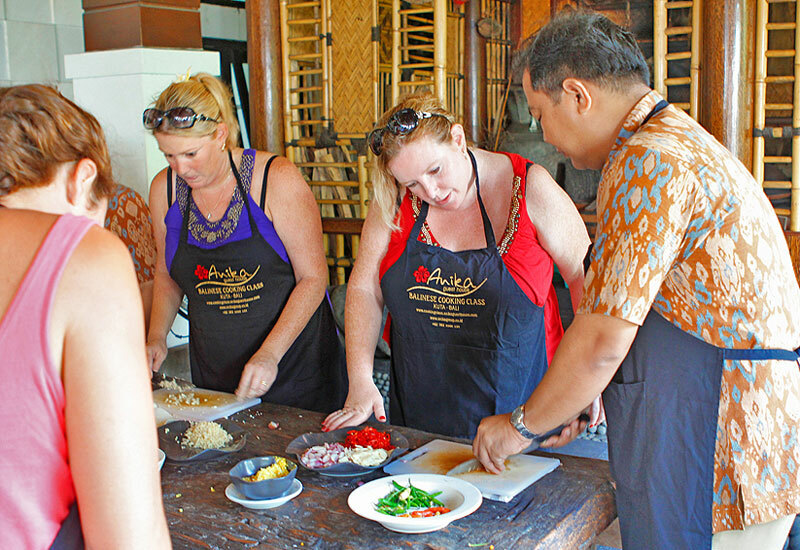 With the assistance of our professional cooking teachers, prepare a complete menu based on regional recipes- nine main dishes and dessert, during an 8 hours hands-on cooking class in English, followed by lunch/dine based on the prepared dishes, accompanied by traditional drink (Hibiscus Tea and Balinese Rice Wine). 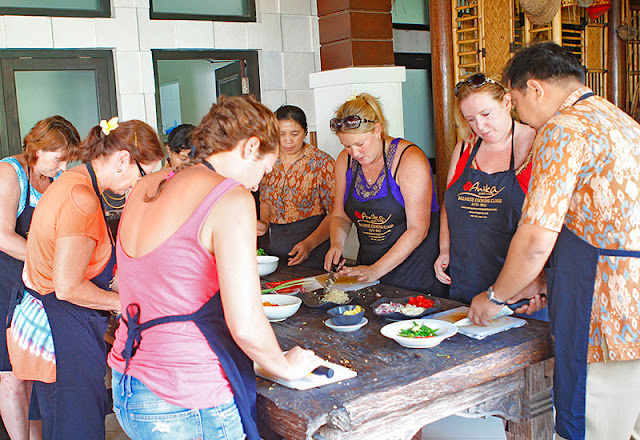 If you are interested in learning how to prepare Balinese signature dishes but you do not have too much time to dedicate to it, consider to join our class.Register now by online form or direct.With reasonable fee, 10 subject menus per class, include transfer service (Kuta, Sanur, Nusa Dua, Seminyak, Jimbaran area only), traditional market tour (morning class only), booklet, and certificate. Morning Class - starting at 7 am. 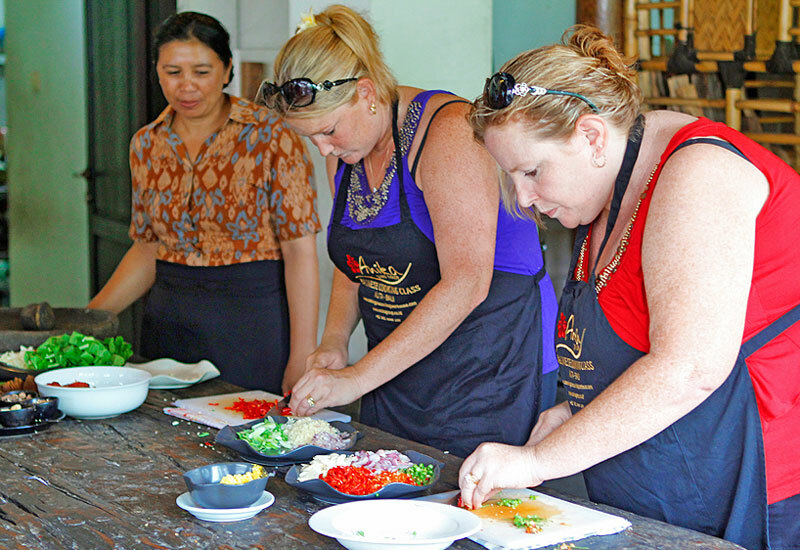 We will pick you up with our transportation from your place/hotel. 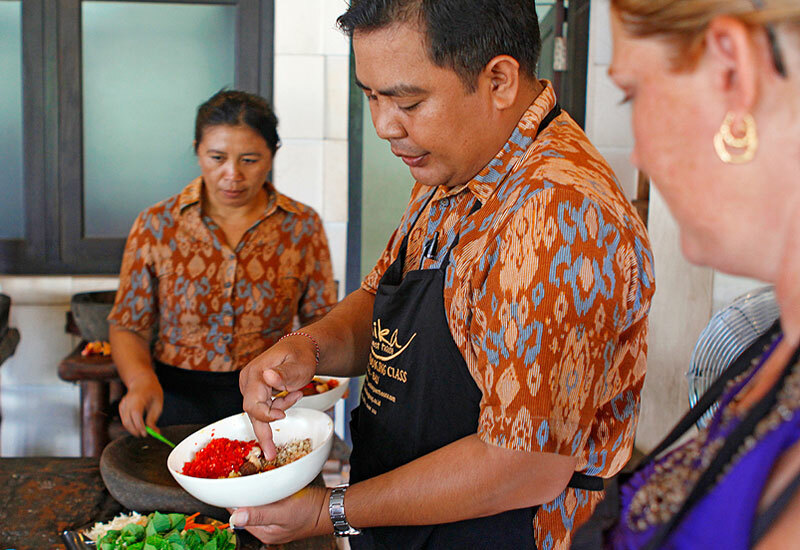 Instructor will guide you to the Kuta traditional Market to buy and explain traditional herbs and spices and also local culture. 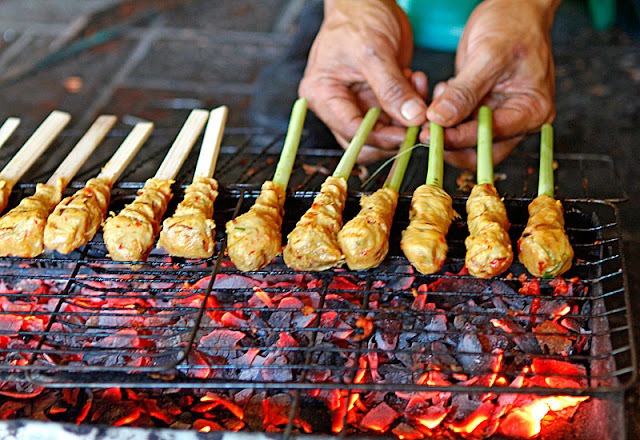 After visit Traditional market about 1 hour you will enjoy traditional breakfast dishes and snacks. 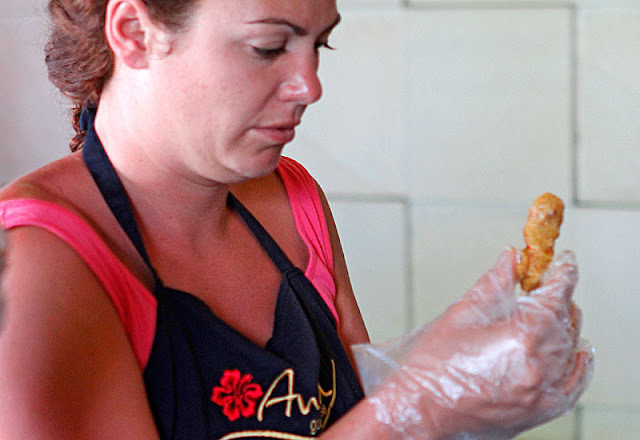 There is no Traditional Market visit for Evening class. Before practical session, the instructor will explain details of every traditional ingredients that will be used for cook. 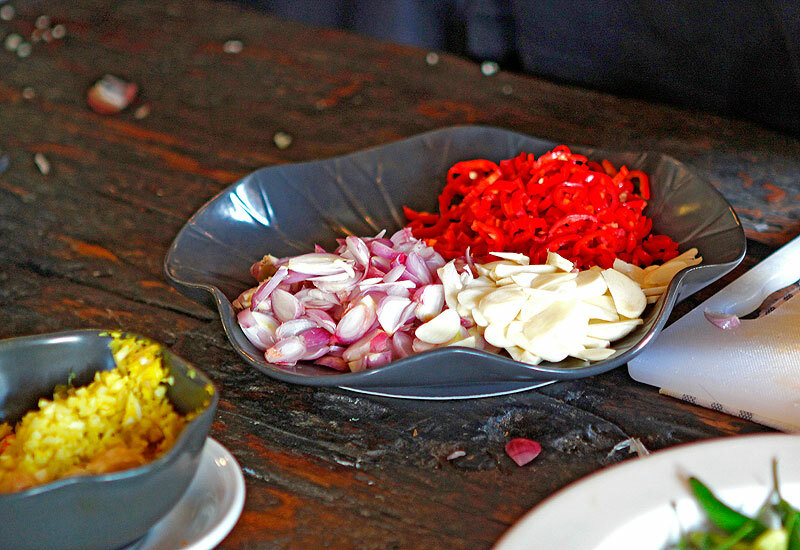 After you are familiar to the ingredients, you will start to cook with traditional techniques and utensils. 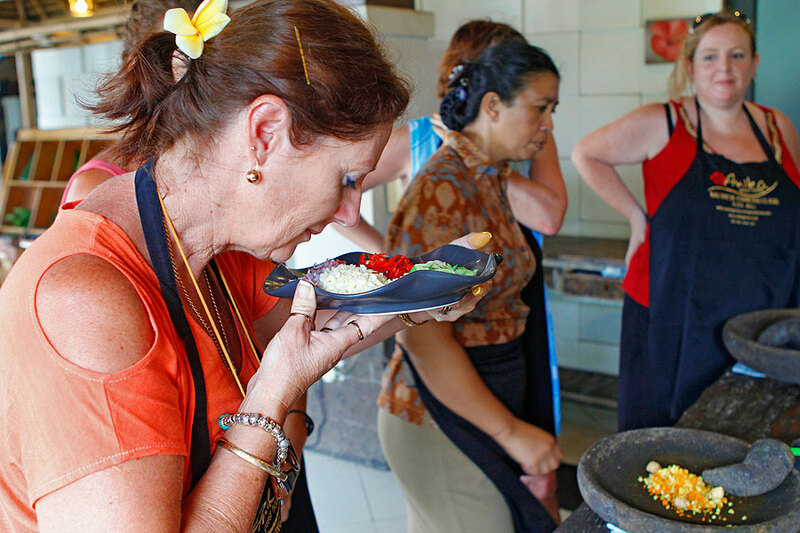 With the assistance of our professional cooking teachers, prepare a complete menu based on Balinese recipes- nine main dishes and 1 dessert, during an 8 hours hands-on cooking class in English, followed by lunch based on the prepared dishes, accompanied by traditional drink (Hibiscus Tea and Balinese Rice Wine).